There are millions of online recipe sites and foodie blogs out there, so many in fact that it becomes a little confusing and overwhelming at times for your average Marco Pierre White wannabe. Which is where Food.com's new recipe search comes in, giving users the ability to pull recipes from all the leading websites including Epicurious, Food & Wine, Cooking Light, Gourmet, Chow.com and loads more. 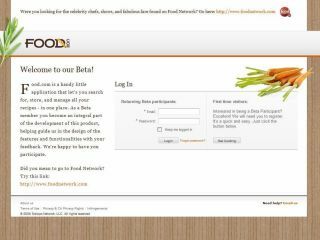 Food.com is currently in beta testing and is the brainchild of Scripps Networks, the parent company of The Food Network. "Food.com is a vertical search engine for recipes and an online repository for recipe collections," reports thefoodsection, noting that social media and bookmarking tools are also in the company's gameplan. It wants to let users chat amongst themselves about favourite recipes, cooking tips and whether or not Jamie is cuter than Marco! Recipe results are filtered by type, cuisine, main ingredient, technique, special diet, cooking time and so on, with users getting the essential list of necessary ingredients. "While ingredient lists are generally understood to be copyright-free, and traffic will ultimately be directed to the recipe owners' sites, this seems like a game-changer for recipe search," adds thefoodsection. Check out Food.com's website for more.